New York City artist, Gwyneth Leech has exhibited her drawings, paintings and installations in the United States and the United Kingdom in museum, commercial gallery, public art and alternative spaces. Since the middle of 2015, she has been focused on documenting in oil paintings and ink drawings the progress at numerous interior and exterior construction sites in Midtown Manhattan as the area undergoes major physical and demographic changes. "Construction Paintings", her first exhibition of this new artwork, was on view in Fall 2016 at the head office of Sciame LLC, a construction company in New York City. In February and March 2018 she exhibited “Construction Series” in the Kaufman Arcade, a public art space in the Garment District, NYC. 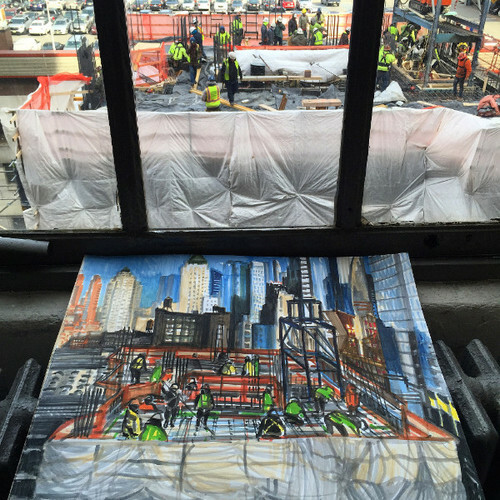 In 2018, her construction site artwork has been featured on NY1 television news, in The Village Voice, in international media and is the subject of a highly regarded short documentary, The Monolith, from New York City director Angelo Guglielmo. 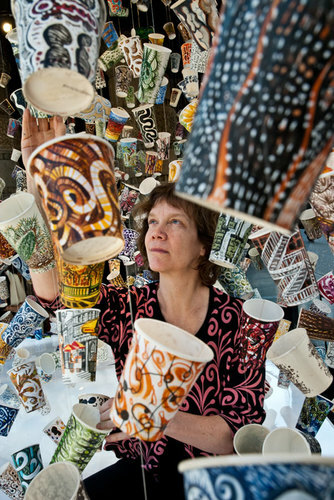 Gwyneth Leech is well known for her artwork on used coffee cups which she exhibited widely as site specific installations, starting in 2011 in the Window Space for Public Art on West 38th Street in New York City's Garment District. Her presence at work in the window was a significant part of the project. In the fall of 2011, the cup project transferred to the Flatiron Prow Artspace, 23rd and Broadway, NYC. The artist was in residence working in public five days a week from September 2011 to February 2012, resulting in a final collection of 850 drawings and paintings on her used coffee cups and a feature article in the New York Times. Subsequently, "Drawings 1-655" were included in "Luxuriant Refuse" at the Pearl Fincher Museum of Fine Art, Spring, TX in 2012. In September 2013, "365: A Year in Cups", a window installation for Anthropologie Regent Street, was a highlight of the London Design Festival. Gwyneth Leech went on to create site-specific cup installations for City Without Walls Gallery in Newark, NJ, Concepto Gallery, Hudson, NY, and in New York City for No Longer Empty, Westbeth Gallery, Hewitt Gallery at Marymount Manhattan College and for the Susan Teller Gallery. Her largest cup installation, "1001 Cup Stories" was shown at the Harris Building in Grand Rapids, Michigan, for ArtPrize 2014 and was voted in the top 10 art installations. Prior projects include a series of alternative family portraits in oils called Perfect Families which was first shown in a New York City commercial gallery in 2006, toured a variety of community and alternative art spaces, and traveled to the Southwest Minnesota State University Art Museum. Gwyneth Leech holds degrees from the University of Pennsylvania, Philadelphia, PA, and Edinburgh College of Art, Edinburgh, UK. The recipient of numerous awards and grants, including several Scottish Arts Council awards, a University of Colorado's President's Fund Grant, an Elizabeth Greenshields Memorial Award and a Thouron Fellowship, Leech's artwork resides in private and public collections.